The brain is the most complex organ in the human body responsible for our movement, behavior and personality. Medical conditions that originate in the brain are some of the most difficult to understand and treat. Among these conditions in Parkinson’s disease, a degenerative disorder that includes symptoms of shaking, rigidity, difficulty walking, as well as cognitive and behavioral problems. 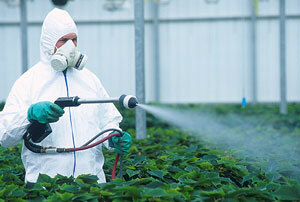 The review analyzed 45 different studies looked pesticide exposure and risk for disease. It found that people exposed specifically to herbicides and insecticides were more likely to develop Parkinson’s disease. Interestingly, the review also found that it didn’t matter whether participants were exposed to pesticides at work, or outside of work – the risk for developing Parkinson’s disease was approximately the same. At the end of the review, the authors call for more research to help identify specifically which chemicals are linked to the disease. As I type this, I look out at my lawn that has more than its fair share of weeds growing in it. But I’m happy that we chose all-natural, corn-based fertilizer’s this year. We’re surely going to be pulling more weeds than if we used stronger herbicides, but I’m happy to avoid anything that could impact my family’s health in the future. Do you have a link to the review as I think it would be an interesting read. Do you have a link to the review?